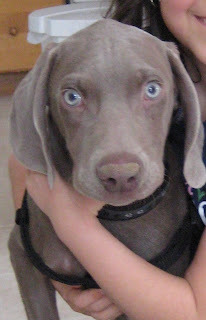 So on Tuesday we got a new pup - Bailey - he's a 3 month old Weimaraner. He's a beautiful dog and sure is a handful, but that's half the fun. I'll definitely be providing updates. Weimaraners are well know for their beautiful eyes and often referred to as the "Grey Ghost" or "Silver Ghost" due to their silver/gray color. I really like the silver Weimaraner. Good luck on your new pup and I'm sure you're gonna love him.